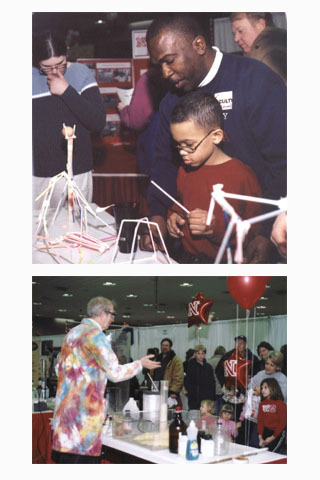 Families enjoyed hands-on activites and experiments at the 2004 Big Red Road Show in Omaha. UNL presents the 3rd annual Big Red Road Show at Qwest Center Omaha Feb. 13 from 1-4 p.m. The Big Red Road Show is an open house event for students of all ages and adults to learn more about the academic and student life programs at the university. Building on themes outlined in his installation address earlier in the day, University of Nebraska President James B. Milliken turned to a handful of colleagues to set the stage for the challenges and opportunities facing higher education. The College of Business Administration will offer a pilot freshman leadership, orientation and development class designed to help first-time freshman students make the transition to university life. This bell sat atop the first building at the University of Nebraska - University Hall. Construction on this ill-fated buildling began just a few months after the university was founded in 1869. University Hall represented the aspirations of the local and state community and developed from an idea "that the new state needed an institution of cultural learning; it was built for farmers and frontiersmen who sought for their children the culture which the centuries had accumulated," according to the 1925 Cornhusker Annual. The International Quilt Study Center will soon have a new home created by one of three well-known architects currently competing for the opportunity to design the building. The new, privately funded building will provide year-round exhibition space; work areas dedicated to research, care and maintenance of the collection, and expanded storage capacity. The 30,000 square foot facility is located at the northwest corner of 33rd and Holdrege streets. The Lentz Center for Asian Culture's winter exhibition is Steel Art: Japanese Swords from the Collection of Professor Peter Bleed, Ph.D. The show runs Feb. 15 through May 8. An opening reception, free and open to the public, will be from 2 to 4:30 p.m. Feb. 19. The Lincoln Symphony Orchestra's "Heart to Heart" Feb. 5 concert will feature the Clinton-Narboni Piano Duo and guest conductor Shinik Hahm of the Daejeon Philharmonic Orchestra of Korea. The concert begins at 7:30 p.m. at Kimball Recital Hall. Scholastic's The Magic School Bus-Live! roars into the Lied Center for Performing Arts at 7 p.m. Feb. 11 with an original musical production. The show is based on Scholastic's award-winning television series seen on The Learning Channel and Discovery Kids Channel in the United States. The series is produced by Scholastic Entertainment and based on the best-selling Scholastic Inc. book-series by Joanna Cole and Bruce Degen. Ellen Driscoll, head of sculpture at the Rhode Island School of Design, will be in the UNL Department of Art and Art History from Feb. 7-10 as the second visitor in the new Hixson-Lied Visiting Artist Lecture Series. Gerald Shapiro, UNL professor of English, will discuss his new book of novellas and stories at a book signing at 7:30 p.m. Feb. 24 at Lee Booksellers, Edgewood Center, 5500 S. 56th St.
Francine Henderson, a specialist in the art and significance of African baskets, will speak from 3-5 p.m. Feb. 8 in the Nebraska Union. Henderson is administrator of the Auburn Avenue Research Library for African American Culture and History in Atlanta, Ga. Her talk, Weaving Baskets in Botswana, Africa, will include many examples from her personal collection of baskets. In the 1970s, Henderson joined the University of Botswana in Southern African as chief librarian and documentalist. Her research included the observation of the making of arts and crafts by African women in Botswana. Original country music and covers of old classics will fill the Lied main stage Feb. 9 when local artists Jim Rice and Final Round present a free concert as part of the Lied's Free at 6 series. The concert begins at 6 p.m.
Felicia Londre, an expert in the theatrics of Shakespeare, will deliver the Norman and Jane Geske Lectureship in the history of the arts 7 p.m. Feb. 21 in the Sheldon Memorial Art Gallery. Her topic is Much ado about Shakespeare on Midwestern Frontier Stages. Mike Leigh is at the peak of his powers with Vera Drake, opening at the Mary Riepma Ross Media Arts Center on Feb. 4. Free Creative Movement classes for boys and girls (grades 3-5) will be offered on Saturdays from 3 to 5 p.m. from Feb. 12 to April 30. This is a required lab class that will be taught by UNL dance majors. Call 472-6657, #2 on voice mail for registration.